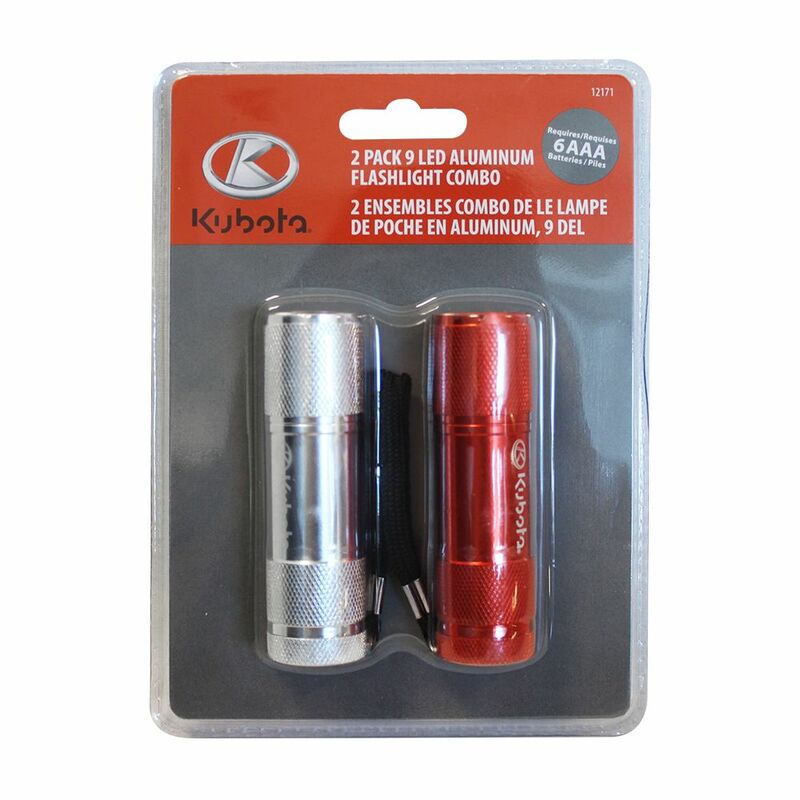 This Kubota 9 LED Flashlight, 2 pack, is perfect for camping, auto emergencies and home repairs. Features diamond knurl design for grip and constructed of lightweight aluminum. Each is powered by 3 x AAA batteries (required). This 100-Lumen LED Flashlight (3-pack) from Defiant is fitted with high-powered LED chips to provide vibrant illumination in the dark. LED technology offers improved battery efficiency, higher brightness and generates less heat compared to conventional lighting. One-handed, lightweight construction makes it easy and convenient for use on the go. It is ideal for camping trips, campfires or power outages. Now you can stay prepared with this reliable light source. Whether you are working, biking, caving, camping, hiking, hunting, boating, or performing delicate operations, this 80 Lumen LED Headlight (3-pack) is a great hands-free illumination device. The headlamp is constructed of tough ABS plastic with an adjustable elastic head strap and an adjustable headlight. Nine AAA batteries are included to power all three devices. The Husky 500-Lumen Virtually Unbreakable Aluminum Flashlight (2-Pack) is built to tolerate abusive treatment. Drop-tested from 9 metres and waterproof up to 1 metre, this flashlight is capable of withstanding the most demanding work conditions. The premium LEDs shine extra-bright light powered by AA alkaline batteries (included). The ergonomically designed aluminum body for superb comfort and grip. 2 pack 9 LED Flashlight Combo This Kubota 9 LED Flashlight, 2 pack, is perfect for camping, auto emergencies and home repairs. Features diamond knurl design for grip and constructed of lightweight aluminum. Each is powered by 3 x AAA batteries (required).